As another year comes to a close it’s time to record the highlights of another busy year in Great British and Irish (GB&I) golf. The Amateur Championship was played at Royal Aberdeen and Murcar Links in north east Scotland. Wilco Nienaber (RSA) was medalist after two great rounds of 66 and 67 (-8). However, his compatriot Jovan Rebula (RSA) was the eventual champion beating Robin DAWSON (IRE) 3&2 in the Final. With the benefit of hindsight John MURPHY’s (IRE) 6&5 win over Viktor Hovland (NOR) in round 4 is noteworthy too. Viktor Hovland (NOR) won the U.S. Amateur Championship played at Pebble Beach G.L. and Spyglass Hill G.C. He beat Devon Bling 6&5 in the Final. Alex FITZPATRICK (ENG) led the GB&I entry reaching the quarter finals before falling to Cole Hammer (USA) 3&2. 2017 USA Walker Cup player Doug Ghim secured low amateur honours at The Masters in April with rounds of 72, 76, 74 and 74 (+8). Luis Gagne (CRI) and Matt Parziale (USA) were the low amateurs (+16, tied 48th) at a controversial U.S. Open at Shinnecock Hills G.C. in June. Prior to the Championship Scotland’s Ryan LUMSDEN recorded rounds of 68 and 70 (-6) in Sectional Qualifying to earn a place in the field. Sam LOCKE (SCO) was the amateur star of The Open Championship at Carnoustie Golf Links. A 69 and 66 (-7) secured medalist honours in the Final Qualifying event at The Renaissance G.C. 18 year old Sam then won the low amateur Silver Medal after rounds of 72, 73, 70 and 78 (+9) and a tied 75th finish. Only time will tell if his decision to turn pro immediately afterwards was a good one. The Bonallack Trophy match was played in Qatar in March with Asia-Pacific beating EUROPE 16.5-15.5. Todd CLEMENTS (ENG) and Matthew JORDAN (ENG) were selected for Europe who disappointingly let a lead slip in the final day Singles. An ENGLAND team consisting of Todd CLEMENTS, David HAGUE, Matthew JORDAN and Gian-Marco PETROZZI won the European Nations Cup at RCG Sotogrande by 20 shots over IRELAND who came second. Clements 69, 73, 71, 70 (-5) won the Individual competition by 5 shots from Alex GLEESON (IRE). The Arnold Palmer Cup moved to a mixed INTERNATIONAL v. USA team format this year. With little allegiance to an International team badge and 24 players on both sides my interest in it certainly waned this time around. It was no surprise to see a very strong USA thrash the International side, which included Harry HALL (ENG), Olivia MEHAFFEY (NIR), Ronan MULLARNEY (IRE) and Chloe RYAN (IRE), 38.5 – 21.5. Finland were the surprise winners of the 2018 European Men’s Team Championship in July, beating ENGLAND 5-2 in the Final. Sweden and ENGLAND led the 36 hole stroke play qualifying at the Faldo Course, Berlin, Germany on 693 (-27). Finland were the final Flight A qualifiers on 718 (-2) but moved serenely through the match play stage to pick up the trophy. GB&I’s loss to a largely second string Continent of Europe 15.5-9.5 in the St. Andrews Trophy match was a major disappointment. Europe won 7 of the 9 Singles on the final afternoon to run out deserving winners in Finland. Denmark won the Men’s World Amateur Team for the Eisenhower Trophy in September. The Danish team of Nicolai Hojgaard, Rasmus Hojgaard and John Axelsen posted a -39 total to beat the USA by 1 shot in the 72 hole competition staged at Carton House GC, Ireland. ENGLAND finally got the better of IRELAND in this year’s Men’s Home Internationals staged at Conwy G.C. in North Wales. David HAGUE (ENG) and Tiarnan MCLARNAN (IRE) were both unbeaten during the week winning all six of their games. Matthew JORDAN (ENG) dominated the Lytham Trophy in early May. Rounds of 67, 69, 70 and 66 gave him a -8 total and a hugely impressive 9 shot victory. The Irish Amateur Open Championship was again played at Royal County Down G.C. with Robin DAWSON (IRE) 65, 71, 69, 77 (-2) prevailing. John GOUGH (ENG) and Alex GLEESON (IRE) were four shots back in tied second. An exciting finish to the Brabazon Trophy saw Nick POPPLETON (ENG) win a play-off against Wilco Nienaber (RSA) after both players finished on -16 at Frilford heath G.C. Andrew WILSON’s (ENG) 63 (-9) in round 3 was the round of the week. John MURPHY (IRE) won the The St. Andrews Links Trophy in June. Rounds of 70 66 71 71 gave him a -9 total before he went on to beat Jannik de Bruyn (GER) on the first hole of their play-off. Royal Hague G.C. staged the European Amateur Championship with Nicolai Hojgaard (DEN) coming out on top after rounds of 71, 69, 68 and 73 (-7). Robin DAWSON (IRE) and Mitch WAITE (ENG) were amongst four players to finish tied 2nd, one shot further back. James WILSON (SCO) beat Tom SLOMAN (ENG) in a play-off at the Welsh Open Stroke Play Championship after they had both finished on 284 (Ev) around Pyle & Kenfig G.C. Victor Veyret (FRA) found the Kings Course at Gleneagles to his liking when he won the Scottish Men’s Open Championship in late August. Scores of 69, 65, 67 and 67 (-12) helped him to a 6 shot victory over Conor PURCELL (IRE). Tom THURLOWAY won the English Men’s Amateur at Formby G.C. overcoming Joe LONG 6&5 in the Final. Tom’s win came just a week after he picked up the Walton Heath Trophy after rounds of 69, 68, 69 and 73 (-9). Two great wins in a short space of time. Euan MCINTOSH won the Scottish Men’s Amateur at Blairgowrie beating Jamie STEWART 3&2 in the Final. Robbie CANNON won the Irish Amateur Close Championship at the European Club. He beat Eoin LEONARD 2&1 in their Final match. Tom WILLIAMS won the Welsh Men’s Amateur Championship in August at Machynys G.C. beating Kieron HARMON 2&1 in the Final. It was a second win for Williams who had earlier in the year won the U21 Bernard Darwin Salver at Rye G.C. Home favourite Vitor Londot Lopez (-15) won the Portuguese International Amateur at Montado in February. Ben JONES (ENG) 71, 68, 73, 64 (-12) and Bailey GILL (ENG) 71, 67, 68, 70 (-12) finished tied 2nd. The Spanish International Amateur at La Manga was dominated by English players. Firstly, Jake BURNAGE, the only player to record an under par total, won the stroke play qualifying with rounds of 73 and 70 (-3). Billy MCKENZIE went on to beat Alex FITZPATRICK 3&2 in the 36 hole Final. Andrea Romano (ITA) won the Italian International Amateur in March with rounds of 69, 70, 72 and 69 (-3) at Donnafugata Golf Resort. Jake BOLTON (ENG) 71, 74, 69, 70 (+1) finished tied 3rd and Charlie THORNTON (ENG) 63, 71, 77, 74 (+2) was tied 5th. Hubert Tisserand (FRA) 69 68 71 72 (-5) won the French International Amateur at Chantilly in late May. Josh MCMAHON (ENG) and Bradley BAWDEN (ENG) were tied 5th on -1. Arguably the best amateur performance of the year came from Cole Hammer (USA) in the Western Amateur Championship, played at Sunset Ridge G.C. near Chicago. Having secured medalist honours with rounds of 65, 68, 61 ,67 (-23) – the unblemished 3rd round included 10 birdies – he beat Davis Riley (USA) in the match play final by 1 hole. En route to winning the Pacific Coast Amateur at The Olympic Club, San Francisco in July Isaiah Salinda (USA) shot a 62 (-9) in round 3 which included 10 birdies. Justin Suh (USA) won the North East Amateur by 6 shots with rounds of 63, 65, 67 and 66 (-15) at the par 69 Wannamoisett C.C. The South Beach International Amateur, now one of the amateur game’s biggest events with a strong field of 210 players, was won in Miami Beach in December by Pierceson Coody (USA). Jake BURNAGE (ENG) was the best of the 19 GB&I players in the field, finishing a creditable 3rd after recording scores of 64, 70, 70 and 71 (Ev) in very windy conditions. David HAGUE (ENG) and Gian-Marco PETROZZI (ENG) took the early season plaudits with strong performances down under in the opening months of 2018. Hague reached the quarter-finals of the Australian Amateur, where he lost to the eventual champion Keita Nakajima (JAP), before finishing 2nd at the Avondale Amateur where rounds of 70, 73, 69, 67 gave him a -5 total. Petrozzi went one better at the end of the tour winning the New South Wales Amateur. Having qualified in tied 4th place after rounds of 68 and 70 (-6) he worked his way through the match play stage before overcoming Jediah Morgan (AUS) on the 37th hole. Sam LOCKE (SCO) finished tied 5th on -18 at the South African Stroke Championship in a low scoring event dominated by Oliver Gillberg (SWE) whose rounds of 67, 62, 64 and 68 (-27) at Pecanwood Golf Estate were exceptional. Caolan RAFFERTY (IRE) -7 tied 6th and Andrew WILSON (ENG) -4 8th at the African Amateur Stroke Play Championship at Glendower G.C. The event was easily won by James du Preez (RSA) -14 who shot a 64 in Round 3 to give him a comfortable lead heading into the final round. The Sanlam South African Amateur Championship was played at Durban C.C. in late February. David LANGLEY (ENG) 67, 70 (-7) was medalist with Calum FYFE (SCO) 70, 71 (-3) runner-up. However, it was Fyfe’s fellow Scotsmen John PATERSON and Euan WALKER who made the bigger impact at the business end of the tournament both reaching the semi-finals before losing to Chris Woollam (RSA) and champion Deon Germishuys (RSA), who eventually required 39 holes to get the job done. Kyle McClatchie’s (RSA) performance at the 2018 Gauteng North Open Amateur is also worth recording. Rounds of 65, 72, 64 and 62 (-25) unsurprisingly gave him a 7 shot victory. McClatchie, who also won the Brabazon Trophy in 2017, turned pro shortly afterwards but has surprisingly struggled to make much of an impact to date. Mitch WAITE (ENG) alerted us to the good season he was going to enjoy by winning the Hampshire Salver in mid-April. He overcame a sluggish start in the Day 1 Selborne Salver at Blackmoor by blitzing North Hants 65, 65 (-8) in the Day 2 Hampshire Hog and coming through the field to win the72 hole title. James WILSON (ENG) won the Battle Trophy at Crail G.C. in April with a 283 (-5) total. His victory was set up by a 63 in round 3, 7 shots better than any other player could manage. The Berkshire Trophy was shared between George GARDNER (ENG) and Matt ROBERTS (WAL) but only after the Englishman finished with a final round 65 to reach the -9 winning total. Sam BROADHURST (ENG) 69, 64, 66, 65 (-16) produced some low scoring at Middlesbrough G.C. to win the North of England Youth Championship. Charlie THORNTON (ENG) won the North of England Open Amateur Stroke Play Championship at Alwoodley G.C. in October with rounds of 71, 73, a memorable 65 and 74 (-1). A strong final day helped James BIGGS (ENG) 71, 74, 68, 68 (+1) secure the Lagonda Trophy at The Gog Magog G.C. Ryan DIXON (ENG) 72, 69, 71, 70 (-6) won the U21 Welsh Open Youths Championship at Wenvoe Castle G.C. Owen BENSON (ENG) beat David LANGLEY in a play-off at Moor Park G.C. to win the Tillman Trophy after they had both finished on 278 (-10). Matthew CLARK 74, 70, 64, 66 (-10) won the East of Scotland Open in early July beating a fast finishing Euan MCINTOSH who applied pressure with a final round 64 to post a -8 total. MCINTOSH didn’t have to wait long for his win though. Rounds of 69, 64, 66 and 64 (-9) enabled him to pick up the North East Open Amateur Stroke Play Championship. Kyle GODSMAN won the North of Scotland Open Amateur with rounds of 75, 64, 74 and 70. Kyle’s 64 included two bogeys on an afternoon where no other player in the field managed to break 70 around the tough Nairn G.C. course. John PATERSON shot rounds of 69, 70, 67 and 68 (-14) at Haggs Castle G.C. to win the Cameron Corbett Vase. Robert BRAZILL beat Alex GLESSON by 1 hole in the final of the prestigious West of Ireland Amateur in April. South Africa’s Christo Lamprecht 66, 68, 69, 71 (-14) won the East of Ireland Amateur Open at County Louth G.C., holding off Mark POWER (IRE) (-12) to secure the title. Caolan RAFFERTY beat Rowan LESTER on the 20th hole of the final to win the South of Ireland Amateur at Lahinch Old in July. Ian LYNCH won the North of Ireland Amateur at Royal Portrush. After Matthew MCCLEAN 67, 68 (-8) had earned medalist honours Lynch went on to beat Kieran BABBAGE (ENG) 2&1 in the Final. Tiarnan MCLARNAN shot a final round 66 (-6), -7 for his final 11 holes, to pip Robert BRAZILL for the Mullinger Scratch Trophy in August. Conor GOUGH (ENG) enjoyed a superb season and was undoubtedly the star performer in GB&I Boys’ golf. He won the Fairhaven Trophy in May (69, 75, 70, 69 -5) and the U16 McGregor Trophy in July (72, 71, 70, 68 (-7), birdieing four of his last 6 holes including his last two. If that wasn’t enough he topped them both by winning the Boys’ Amateur Championship at Royal Portrush and Portstewart G.C.’s. Robin WILLIAMS (ENG) was medalist in the stroke play qualifying before Gough (ENG) beat Jose Luis Ballester 3&1 in the Final. Joe PAGDIN (ENG) and Jensen HULL (ENG) were the two losing semi-finalists. A few weeks later an in form Jensen HULL won the Men’s Waterford Trophy by 5 shots after scores of 70, 70, 67 and 68 (-5). Barclay BROWN (ENG) won the U18 Carris Trophy 73, 68, 68, 71 (-8) memorably overtaking a faltering Gregory De Leo (ITA) -7 with two birdies on his last two holes. In November the Sheffield man also secured The Telegraph Vitality Junior Golf Championship. Rounds of 73, 70 and 72 (-1) helped him to a 5 shot win in Spain. Tom MCKIBBIN (NIR) won the inaugural Faldo Series Major Champions Invitational in March, played at Bella Collina in Florida, with scores of 68, 67 and 69 (-12). A few weeks later Joe PAGDIN (ENG) came close in the men’s Azalea Invitational in South Carolina. Rounds of 73, 67, 67, 66 (-11) earned him a place in a play-off with Cole Hammer (USA) and Hugo Bernard (CAN) before the American birdied the first play-off hole. Harrison ARNOLD (ENG) survived the wet weather at Copt Heath G.C. to win the Peter McEvoy Trophy. Reduced to 36 holes a second round 67 was good enough to sweep him to the title with a 139 (-3) score. Laurenz SCHIERGEN (GER) won the Sir Henry Cooper Junior Masters by 10 shots at Nizels after rounds of 71, 65, 67 and 71 (-14). Connor MCKINNEY (SCO) -4 and Thomas SPREADBOROUGH (ENG) -1 were the only other boys to shoot under par. After a mass exodus to the professional ranks (see below) 2018 was always going to be a tough year for Welsh golf but Archie DAVIES looks like being a leading light for the next generation. His 3 shot victory at Belvoir Park in late June at the Irish Boys Amateur Open Championship with rounds of 69, 70, 68 and 69 (-8) was certainly encouraging. Hugh ADAMS (ENG) 72, 71, 67 (Ev) won the U14 Reid Trophy in August. The youngster from Hagley in the West Midlands beat Angel Ayora (ESP) on the fourth play off hole at Reading G.C. Harry GODDARD (W4 L1 H1) led England to victory over Ireland in the Boys’ Home Internationals played at Royal Dornoch G.C. in early August. The Jacques Leglise Trophy was played in Finland with GB&I comfortably beating the Continent of Europe 15.5 – 9.5 at Kytäjä Golf. English pair Conor GOUGH and Robin WILLIAMS were unbeaten, winning two and halving two of their games. The Junior Ryder Cup was played at Disneyland Paris in September. The EUROPE team, including Annabell FULLER (ENG), Conor GOUGH (ENG) and Robin WILLIAMS (ENG) in their ranks, fought bravely on the final day before narrowly losing 11.5 – 12.5 to the USA. Another English junior to breakthrough during the year was Yorkshire’s Ben SCHMIDT. Runner Up to Gough at the McGregor Trophy Ben went on to win the Lee Westwood Trophy at Rotherham G.C. (65 66 70) after a play-off with Alex IRELAND (ENG) and the English Boy’s County Champion of Champions event at Woodhall Spa 70 72 (-4) in September. He certainly looks like a player to watch in the future. Viktor Hovland (NOR) will end the year as the #1 ranked player in the Scratch Players World Amateur Ranking, in my opinion the world’s most accurate ranking of amateur golfers. Following his performance at the South Beach International last week Jake BURNAGE (ENG) #43 has just passed Harry HALL (ENG) #44 to take the leading GB&I player title, albeit they have an almost identical number of points. Ireland’s Conor PURCELL is not very far behind them in 3rd place either. Justin Suh (USA) currently heads the World Amateur Golf Ranking. Braden Thornberry (USA) won the McCormack Medal as the leading player in the WAGR at the end of August. GB&I’s leading player in the WAGR at the end of the year is Conor GOUGH (ENG) who is 19th. Mitch WAITE (ENG), Alex GLEESON (IRE), Euan MCINTOSH (SCO) and Jake HAPGOOD (WAL) respectively won the four home nation Orders of Merits. As is always the case many of our leading amateurs took the plunge into the professional ranks during the year. Todd CLEMENTS (ENG), Robin DAWSON (IRE), Harry ELLIS (ENG), Craig HOWIE (SCO), Matthew JORDAN (ENG), Paul MCBRIDE (IRE), Gian-Marco PETROZZI (ENG), Nick POPPLETON (ENG), Mitch WAITE (ENG), Andrew WILSON (ENG) and Jonathan YATES (IRE) were some of the names we waved goodbye to this year. Copyright © 2014-2019, Mark Eley. All rights reserved. The United States of America (USA) will start as firm favourites to win the Walker Cup when the 2015 match is played this coming weekend. 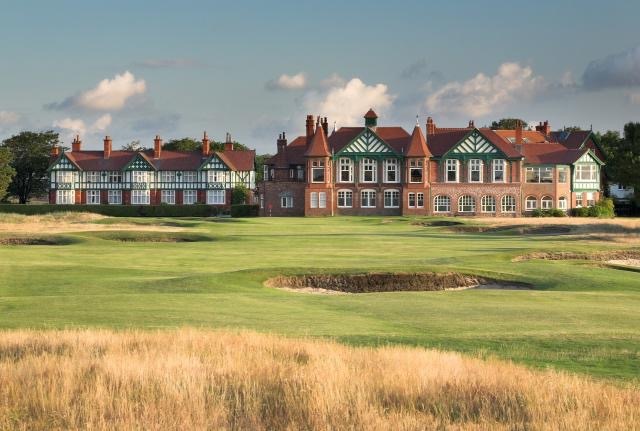 The 45th match in the biennial series is being played at Royal Lytham & St. Annes Golf Club, just south of the famous seaside town of Blackpool in Lancashire, England. However, with plenty of links experience, a good knowledge of the Lytham course, a little bit of rain and wind forecast and the support of thousands of home fans who’s to say Great Britain and Ireland (GB&I) can’t pull off an upset. Recent matches on these shores – at Ganton, Royal County Down and Royal Aberdeen – have all been close and no one should be surprised if this one follows suit. Saturday Day 1 – Four foursomes (AM) and eight singles (PM). Sunday Day 2 – Four foursomes (AM) and ten singles (PM). With one point awarded for each win and a half point for a draw the winning team will be the first to achieve 13.5 points. The GB&I team will be captained, for the third consecutive time, by Nigel Edwards, a four time player (2001-03-05-07) whilst the USA team will be captained for the first time by John “Spider” Miller, who competed in 1999 at Nairn, Scotland. 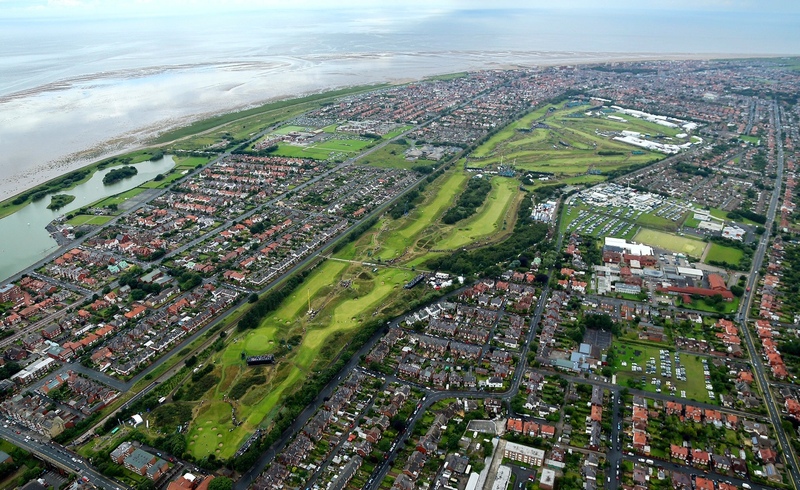 One of the most famous links courses in the world, Royal Lytham was founded in 1886. It was laid out in 1897 but then re-designed in 1919 by the great Harry S. Colt. It is a strategic, heavily bunkered course where accuracy nearly always overcomes length. Off the blue championship tees Royal Lytham is a 7,118 yard par 70. The front nine plays 3,437 yards, a par 34, whilst the longer back nine, being 3,681 yards, is a par 36. 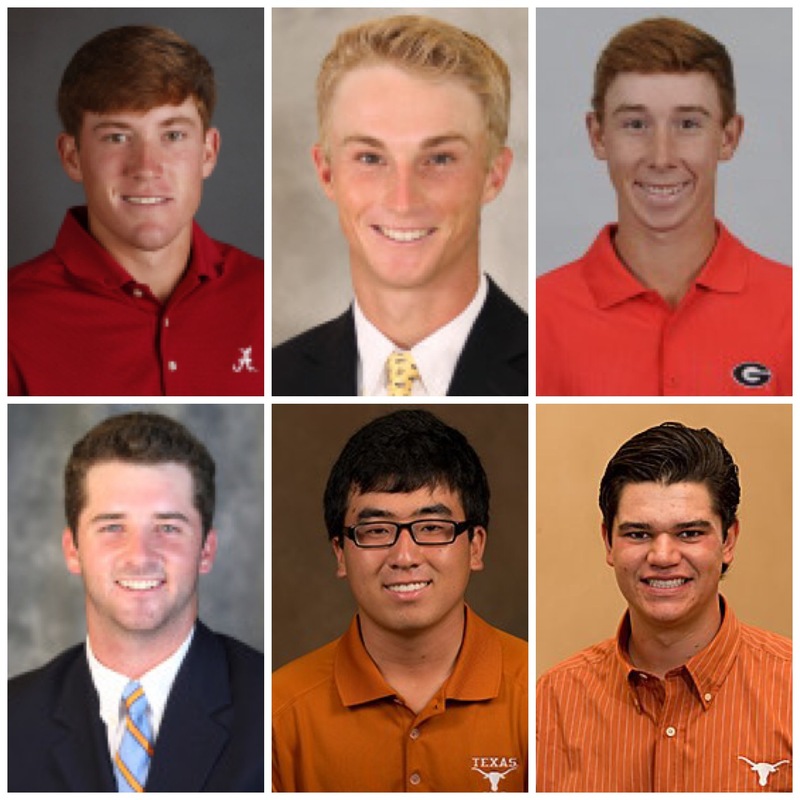 The Walker Cup is contested by ten male amateur players from both the USA and GB&I. The former team is selected by the United States Golf Association (USGA) and the latter by The R&A. The first official Walker Cup match was played in 1922. It was the brainchild of George Herbert Walker, the maternal grandfather of President George H.W. Bush. Walker was the President of the USGA in 1920 and offered to donate the trophy that is still played for today. It should be noted that it was the American press that christened the trophy the Walker Cup rather than the far more modest Mr. Walker. The USA leads the series W35-L8-D1. However, in recent years the match has been more even – each side winning five of the last ten matches since 1995. Having said that the USA are building up some momentum again winning four of the last five. This far out there still remains some uncertainty about this weekend’s forecast. Sat. 12th Sept. – AM Showers / PM Cloudy. Wind 16 mph (NE). Temp. Max. 16°C / Min 13°C. Sun. 13rd Sept. – AM / PM Cloudy. Wind 12 mph (NW). Temp. Max. 17°C / Min 11°C. The opportunity to watch some of the best amateur golfers in the world up close shouldn’t be missed for those that can make it to Lytham. There is free public car parking close to the course and day tickets costing £30 can be acquired on the gate. Twitter – @RandA / @WalkerCup / #WalkerCup, not forgetting @GolfBible ! 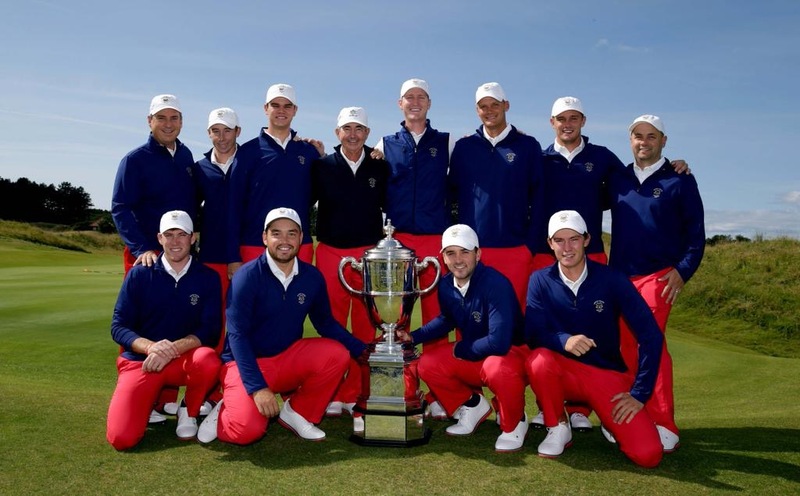 It seems early but the countdown to the 2015 Walker Cup is already underway. 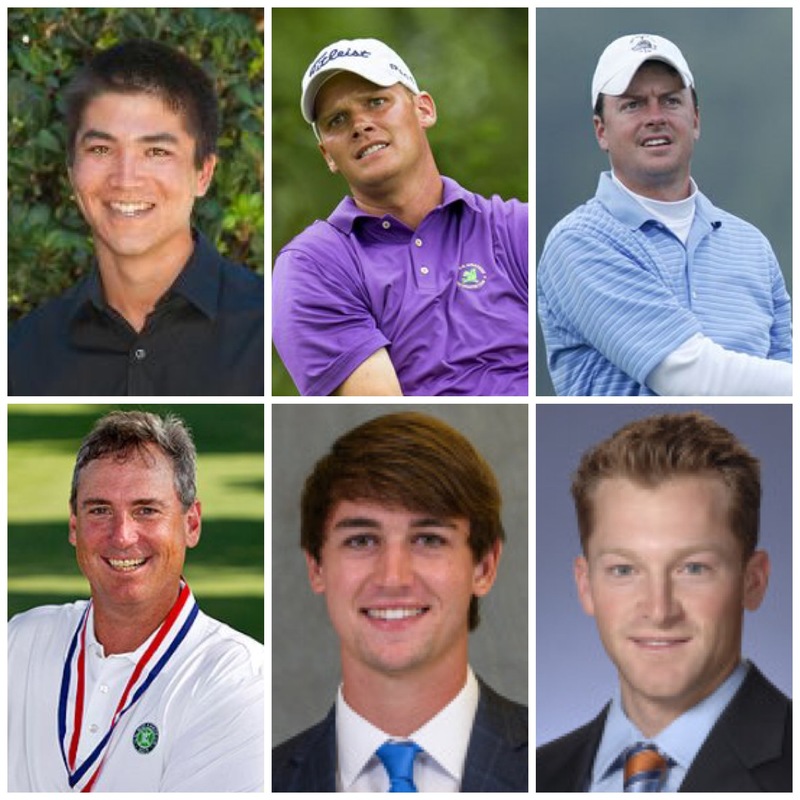 On 13th November 2014, a full 304 days before the next instalment of this biennial contest starts, the USGA announced their first Walker Cup training squad. As has become the norm in Team USA’s preparations a turn-of-the-year practice session is to be held; this time on 17th – 20th December at Frederica GC in St. Simons Island, Georgia. The 45th Walker Cup Match will take place at Royal Lytham and St. Annes Golf Club in Lancashire, England on 12th and 13th September 2015. 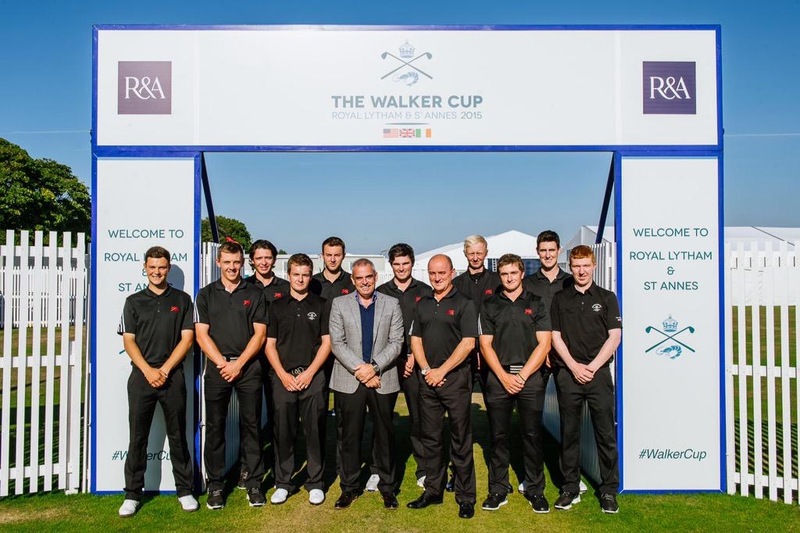 For more information on the 2015 Walker Cup and Royal Lytham please click here. As the USA have shown their hand first I thought I would take a closer look at their training squad and what it tells us. Whilst neither team will be confirmed until mid-August 2015 it is interesting to note that nine of the final ten in the 2013 USA Team attended the first practice session held that year in January 2013. Therefore the 16-man squad named two weeks ago is likely to be a very good indicator of who we may see on the Fylde Coast next September. I have listed the USA players below in order of their current World Amateur Golf Ranking Positions (WAGR). I have also provided some basic biographical information and their current Scratch Players World Amateur Ranking (SPWAR). The differences highlighted between an individual player’s WAGR and SPWAR ranking are in themselves interesting. Property Manager and former Mini-Tour Professional. 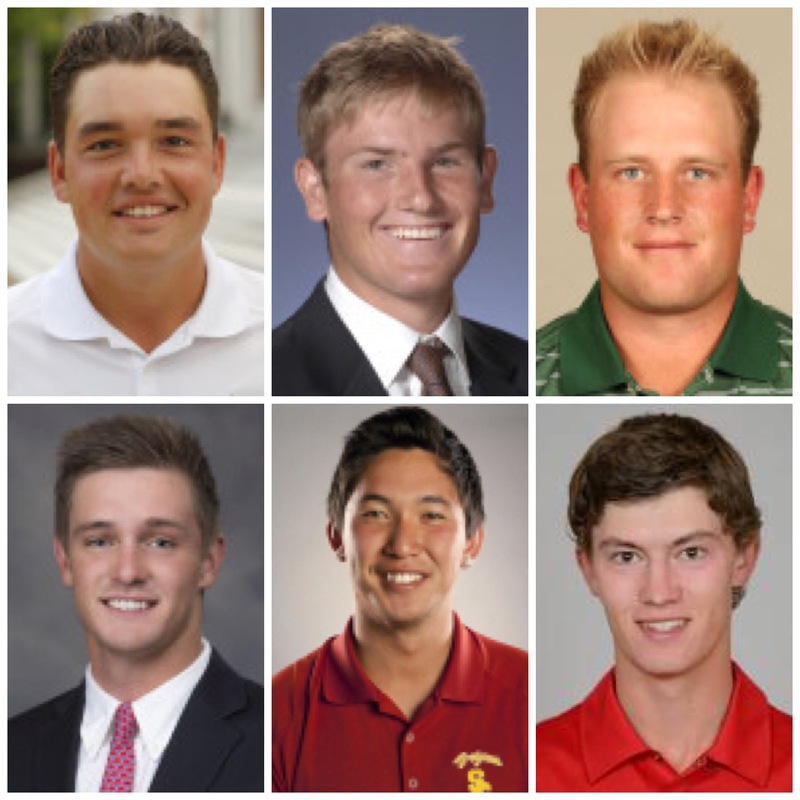 If you will forgive me for stating the obvious the USA Team is again going to be very strong with a foundation of elite amateurs, with both major Am / Pro championship experience and victories as well as sound current College playing records. However, in GB&I’s favour is home advantage and the challenge of links golf which will be a new experience to many of the USA team. May be a bit of September wind and rain will help too. The USGA have a policy of including a minimum of two mid-amateurs (aged 25 or over) in their team. Whilst some commentators argue that this weakens their team it is clear from the squad selections that it will be continued in 2015. Of course Captain Miller also played his one Walker Cup in 1999 as a mid-amateur in his late 40’s. What was a surprise was why it was felt necessary to include three mid-amateurs (denoted with a *) in the squad. The inclusion of the 2013 US Mid-Amateur Champion Mike McCoy, now 52, in particular looks a little odd given his rankings. Looking at the current WAGR’s notable omissions from the practice team were Ollie Schniederjans (WAGR – 1), Brian Campbell (WAGR – 8), Sam Burns (WAGR – 12), Xander Schauffele (WAGR – 26) and Jack Maguire (WAGR – 37). In other words the USA team could still be improved or in reality may have been stronger. I say this as we can probably now assume that in the case of Schniederjans and Campbell they must have already indicated an intention to turn Pro next Summer prior to the match. In the case of Burns, Schauffele and Maguire they clearly still have work to do in convincing the Selection Committee of their merits. Miller doesn’t seem overly keen at this stage on giving youth an opportunity at Lytham. Burns, 18, has been overlooked as has well ranked Cameron Young (WAGR – 32), Scottie Scheffler (WAGR – 33) and Davis Riley (WAGR – 41). Mid-amateur Nathan Smith is the only member of the current squad who played in the 2013 Walker Cup at the National Golf Links of America (he also played in 2011). Jordan Niebrugge (WAGR – 64) could add some more experience from the victorious 2013 team but clearly needs to show some better form to get pack in the picture. Of course, that is exactly what he did in 2013 as he was the player who forced himself onto the team last time through outstanding play. In theory selection for the December 2014 USA practice squad means nothing but, as noted above, in practice it has in the past proven to be a good indicator. There is still plenty of golf to be played next year so only time will tell how close the Selection Committee have got it on their first stab. Another unknown in the USA selection equation is who will succeed the current Selection Committee Chairman Dan Burton who steps down from post in February 2015 ? Only time will tell if a new person leads to a different approach and new names being put forward. Finally, look out for my early thoughts on a possible ‘GB&I Squad’ which will be coming soon. Copyright © 2014, Mark Eley. All rights reserved.